We've gone to town on the recently released Nvidia GeForce GTX 760 by taking a look at the reference card and three aftermarket, pre-overclocked models from Palit, Gigabyte, and EVGA. The trio of partner-overclocked cards have their respective merits, with some focusing on performance and others on quietness, but no card has yet been perfect - a must buy, if you will. MSI is hoping to change our opinion on how good the GTX 760 can be. It's launched just one variant so far, dubbed the N760 Twin Frozr 2GD5/OC, and it fits in alongside the also-new Gamer range of motherboards. First impressions are positive. MSI's card is arguably the best built of the four add-in card (AIC) partners' offerings that we have come across. The PCB is non-standard, measuring around 10 inches, while power regulation and sourcing are both upgraded by using two additional phases and an 8+6-pin delivery, respectively. Two 95mm fans sit on top of a heatsink that is aided by a trio of heatpipes. Interestingly, and keeping in with MSI's thinking on past coolers, there are two 6mm and a thicker 8mm 'pipe that transfer the heat from the GPU to vast array of aluminium fins. The fatter heatpipe juts out of the back and is positioned close enough to the power connectors to make it a little difficult to attach or remove the PCIe cables. All this attention to cooling and the very name of the card intimates reference-beating frequencies, and MSI duly obliges by clocking it in at 1,020MHz core that's guaranteed to boost to at least 1,085MHz. Memory speed, meanwhile, is at a standard 6,008MHz. MSI's clockspeeds are rather conservative, going by what we've seen from other partners - Gigabyte and EVGA, for example, clock their cards in at 1,070MHz-plus - but the firm enables a higher core clock via its Gaming App. The software is part of the overall bundle and, once installed, provides three usage modes: OC (increases speed to 1,085MHz and 1,150MHz boost), Silent (reduces speed to 981MHz/1,046MHz, to aid quietness), and Gaming (default 1,020MHz/1,085MHz setting). Memory speed remains at 6,008MHz for all three presets, mind, and we'd really have liked to see it increased in concert with the elevated core clocks. Appreciating the Gaming App is a neat utility that has to be manually installed, it's a shame there's no corresponding hardware switch on the board itself, enabling the user to effortlessly switch between modes without relying on additional software on the system. The 2GB framebuffer is split over both sides. The upper side, underneath the heatsink, is indirectly cooled by a large aluminium plate and the air produced by the two large fans. However, the four chips on the bottom receive no such treatment and, as you can see, are left bare. Rear outputs, you may have guessed, remain identical to every other GeForce GTX 760. 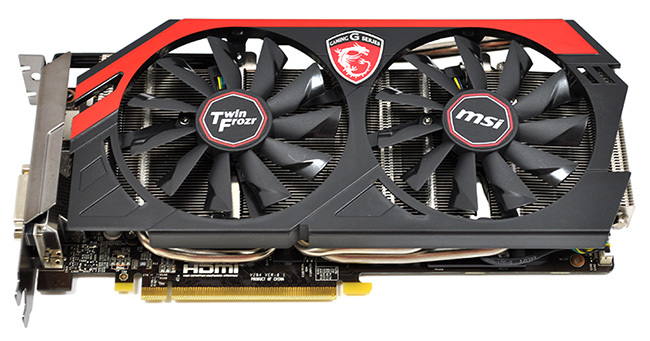 MSI's card is currently priced at £220, or around £20 above bone-stock cards, and the price is competitive against other partner-overclocked GTX 760s. 3 Sony TVs: Spring is Coming!